Muybridge gained fame in 1878 by successfully photographing former Governor Leland Stanford's racehorse, Sallie Gardner, galloping before cameras in Palo Alto, California. He went to Philadelphia five years later on the recommendation of the painter Thomas Eakins (q.v. ), who shared his enthusiasm for photographing and studying the motion of humans and animals. Commissioned by the University of Pennsylvania to undertake further studies, Muybridge produced 781 photolithographic prints for his pioneering work Animal Locomotion. The publication was intended to provide well-defined pictures of the human figure and animals from which artists could understand and delineate with exactitude poses not previously seen by the naked eye. 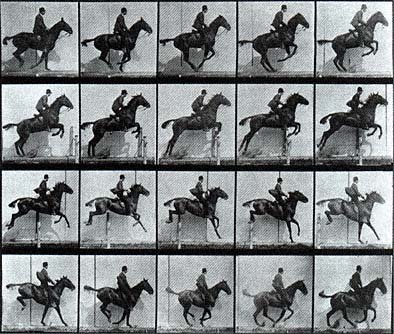 In this series of consecutive frames, a bay horse and her rider proceed down a track and over a hurdle before a row of twenty cameras placed at a right angle to the mare's path. To make the exposures the photographer employed electromagnetic shutters that fired sequentially through a clock-driven electrical device.